The world of tattooing is full of great stories. Tales of struggles and triumphs, voyages of discovery and journeys of personal fulfilment, all bonded together with laughter and pain, flesh and blood. Like ink into the skin, we absorb them and they inspire us. We all need to be inspired in order to inspire others. That is the spark that that lights the touch paper, the fire that burns away mediocrity. 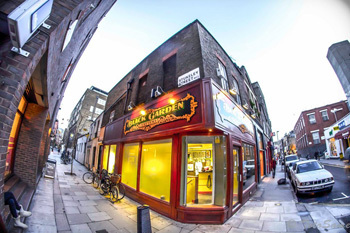 The story of Black Garden Tattoo is one of such tale. It tells of six artists, scattered across the world, each with no knowledge of the others existence. All with completely different backgrounds but all with one burning passion…. tattoo. Each of them hungry for knowledge, each of them reaching the same conclusion – that they must leave their country. Individually they packed up their sketches and flew thousands of miles to a city of 10 million people – London, a city that is full of promise but makes no promises. Thousands have found this out to their own cost. Yet somehow, they all found their way to Black Garden and got what they came for.